Colors are great. Needed a cherry red and wanted to add spa-ish blue and it's perfect. It has a zipper so it can be cleaned. Nice and firm. I plan to buy a second one. 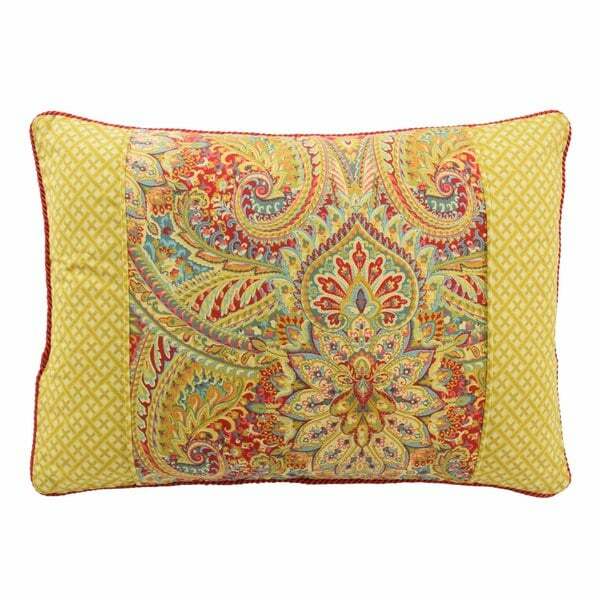 Bring your space to life with the exuberant colors of this oblong decorative throw pillow. Designed in cheerful summery tones, the pillow reverses to a simpler allover crosshatch pattern, allowing you to decorate your space according to your mood. Quality accent pillows!! Made with zipper so that it can be washed. Once again, this product exceeded my expectations! It is a heavy, high quality pillow. Very nice heavier type pillow, it's not just fluff. It has a zippered cover for easy washing. Machine washable, nice. The pillows match the balances I bought. They brighten up the living room, I just love it! No title. Just your average person. Looks great with the comforter to match. Beautiful throw pillow with Waverly quality!! This looks really good on my bed. I bought the matching bedspreads and other pillows plus the curtains and I am very pleased. The color is exactly as stated. I purchased two of these, and I am more than thrilled with them! They are beautiful and well made and well worth the price. The colors are spot on and go well with anything from your brown leather furniture to add a pop of color or your off white furniture that will brighten it up even more. I love this pillow. It’s the perfect size, the pattern is very boho and it ties my two adjoining rooms together well. Came quickly! "Are the true colors of the window valance a mustard gold color accented with teal and salmon? Thank you All of the items look to be different colors on my screen....valance, bedspread and throw pillow"
This pillow is a true bright golden color. We recommend referring to reviews for a firsthand response.